With the support of the Ecofund community, Eiffage Senegal and the German Embassy in Dakar, Augustin, the Champion of the project, and his Association for the Protection de l’Environnement du Sénégal–APES, were able during the first phase of the ecoproject, to preserve 32 hectares of a beautiful endemic littoral forest in the south of Senegal, next to his village of Diembereng in Casamance, see our funded ecoprojects Casamance Ecoparc >>>. Furthermore, thanks to the Ecofund legal advice, a convention was signed by Augustin and the local authorities declaring the Ecoparc as a first “community forest reserve” on a privately owned land. The Senegalese Minister of Environment, Haidar El Ali, calls Ecoparc a model to be replicated in each Senegalese village. The forest was endangered by land speculation, by poachers, wild fires and grazing domestic animals (cows, goats), illegal wood coal production, and agriculture land pressure (rise production). 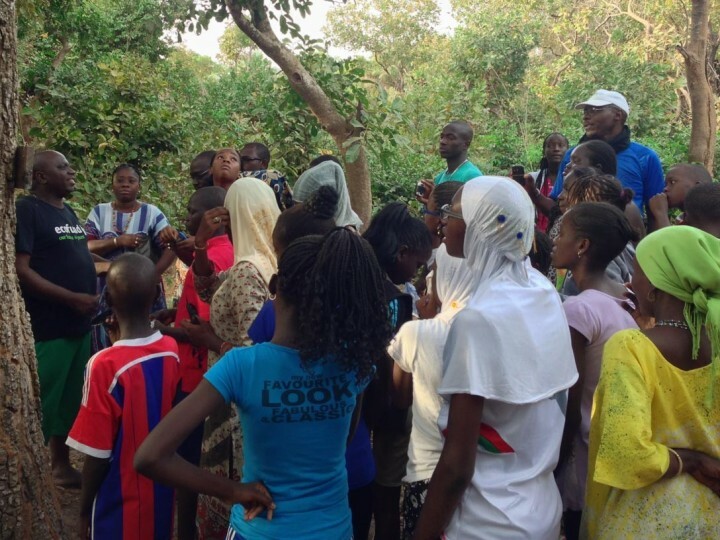 Today school groups, students from the agro-forestry department of the University of Casamance, international researchers, tourists visiting from Cap Skirring, curious locals from Diembering and other neighboring village come to visit these green lungs. Each and every one discovering firsthand this vibrant green heart, rich in little known medicinal plants, fruit trees (lemon, mango) and wildlife (monkeys, warthogs). Augustin has successfully mobilized the youth of his home region to engage in the protection of their beautiful but endangered nature: during school holidays they will collect waste, in particular the ubiquitous plastic waste, and also undertake small reforestation programs in the villages, on the littoral and in the forest. Augustin leads social change in his locality in order to preserve our planet. I’m Augustin Diatta, married with 4 children. I’m a local entrepreneur, owner of a tourist camp in Casamance. I would like to sincerely thank the 39 donors of the Ecofund Community for your precious support towards putting in place the enclosure and the legal status for the protection of our beautiful littoral forest. Above all I would like to thank the “small grant” donors: each of your donations represents an inestimable treasure for the budget and for the spirit of our project. THANK YOU! For almost seven years now, I’ve been working with the help of my family and friends to establish the Ecoparc. Your support has been an important encouragement for us in the realization of the Ecoparc. For us in Casamance the forest is sacred. The forest doesn’t belong to us, we belong to this forest. Its fruits are of important nutritive and medical value for our village. The forest also attracts responsible and sustainable ecotourism benefitting our local economy. We count on your support, your encouraging words and your donations to our development project for a sustainable protection of the Ecoparc. During the last seven years, with my association, I have already made the first investment in the Eco-lodge “Ecole Nature” of about 30,000 euros by constructing 3 simple Casamance style huts, one for the teachers, one the pupils and one for the information and meeting centre. We have good news for closing of financial gap for the Eco-lodge “Ecole Nature”: Ecofund has successfully raised funds from Eiffage Senegal and Eiffage Group in Paris! Encouraged by the results of the first project phase and convinced by the approach of Ecofund our corporate partners will contribute 31.700 euros to the project. This donation will entirely cover the upgrading and the equipment with solar energy of the Eco-lodge. We still need to raise funds to set up the “Ecological Path”. The Ecofund Community is solicited to help financing the costs of professional support in the set-up of the ecological path: path concept, editing and translating of the information panels, print and installation of the panels. 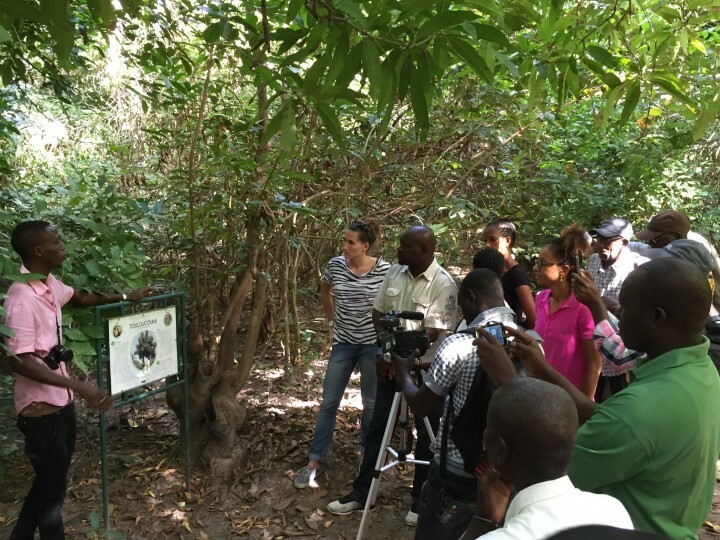 As for the Ecolodge, Augustin, his association, and the students from the University of Ziguinchor will contribute in kind to the ecological path by creating the content on Ecoparc fauna and flora, by tracing the path and setting up the information panels. Your support Thanks to the community based and participatory approach of Ecofund will be a big boost! 01.02.2016 › We wish you a very happy green 2016! We wish you a very happy green 2016! At the beginning of this new year, we have very good news for you: the Ecoparc’s two nature trails and its Ecolodge are now officially open! In November we celebrated the official opening of the Casamance Ecoparc, together with our project partners, Eiffage and the German Embassy in Senegal, with the presence of representatives of the French Embassy in Senegal and the Diembering community, among them many young people and children! The Casamance Ecoparc is the result of five years of work on the ground and your support. Through its creation, the forest of 32 hectares of the Ecoparc, which would otherwise have been destroyed like neighbouring forest areas, has now become the first privately managed protected forest reserve in Senegal. 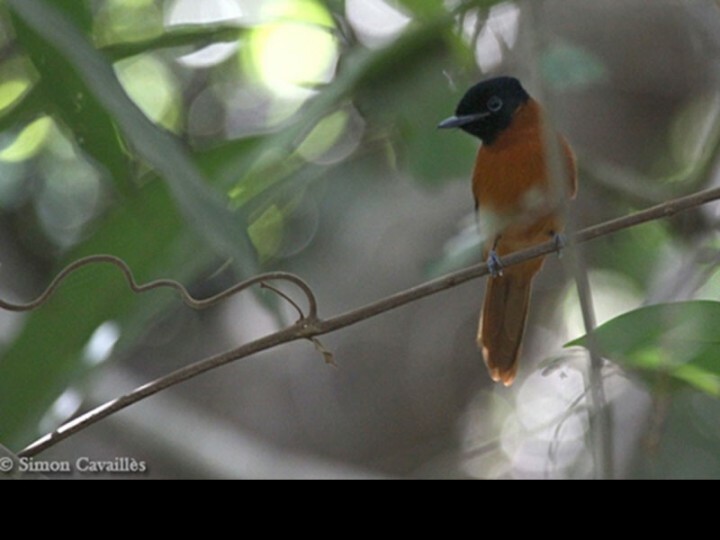 You have participated in the enhancement of this magnificent conservation area of the Casamance flora and fauna! Google images highlight the extent of the deforestation in Casamance over the past 10 years, particularly along the coast and help us to really understand the importance of this project. The opening of the Ecoparc took place on the eve of COP21 in Paris. This was to send the message that while climate change conferences and government laws are important, we also need more concrete actions like the Casamance Ecoparc to preserve our ecosystems. Indeed, according to Global Forest Watch, the earth lost 18 million hectares of tree cover in 2014 alone, of which 50% was from West Africa! Over the last 25 years we’ve lost a forest area equal to the size of South Africa!!! Yet, more than 20% of world’s estimated 1.6 billion human population are dependent on forests (fruit, leaves, roots, medicinal plants and game) for their survival. The latest World Forestry Congress called for the inclusion of local populations in the protection and sustainable management of forests, which is precisely the mission of the Casamance Ecoparc project! 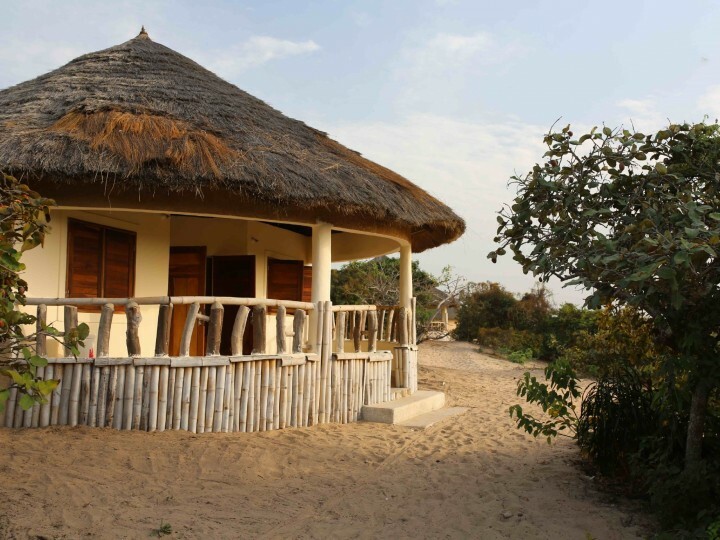 The Casamance Ecoparc is situated in Diembering, around 10 km from Cap Skirring, one of the main tourist centres in Senegal. The Ecoparc forest constitutes the northern limit of the vast Guinea-Congo forest biome/ecosystem; evergreen forests dependent on high rainfall and humidity. 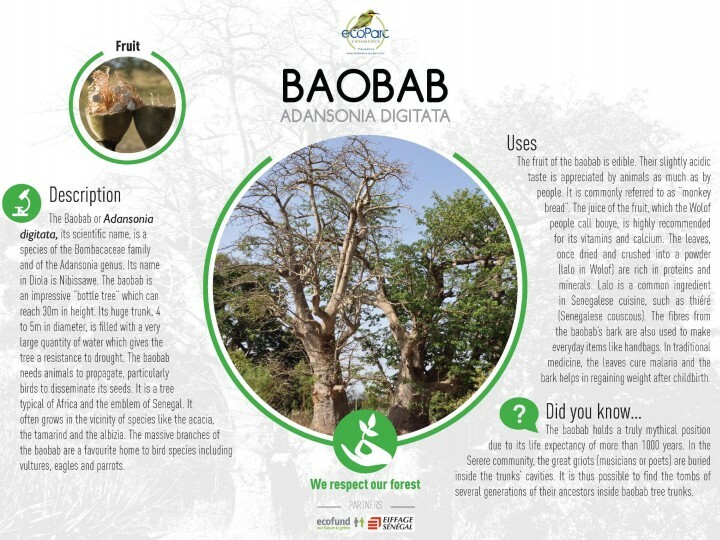 In the Ecoparc you can admire exceptional trees like the Fromager, the Baobab, the Carapa, the Fara, the Oil palm tree. You can also find many bird species, some of which are the rarest in Senegal, thanks to the park’s unique habitat, which provides for their specific needs. The 25 panels placed along the two nature trails help visitors to discover and learn about the importance of the natural treasures of the forest and the need for their protection. These panels provide well-presented and easy to understand information on the Ecoparc species and their traditional uses. • Its own six-panel solar electricity system. At the Ecolodge visitors (school children, tourists, researchers) benefit from beautiful views, tranquillity and delicious meals based on local natural products. In addition to the project’s impact on the conservation of the Ecoparc forest, it also contributes to the local economy and therefore helps to endorse the value of the area’s natural resources: carpenters and printers from the region worked with pride for the Ecoparc by choosing materials that balance sustainability with basic environmental criteria; the Ecolodge contributes to the development of ecotourism in Casamance, a region which does not yet fully benefit from its sustainable development potential. The Casamance Ecoparc is the result of collaboration between Ecofund, APES (the Senegalese association for the protection of the environment), EIFFAGE, the German Embassy in Senegal, and the help of our invaluable contributors: Johannes and Henning from Germany, Marjolaine and Moise from Senegal, Moana from Tahiti as well as our individual donors from all over the world … it has been a great collective effort, showing what passionate people can accomplish together! In 2015 we also launched, together with the IMEM (the Senegal Institute for Environmental and Metrology professions), “Green Talks” Senegal, a series of public debates covering important and timely environmental topics. Plastic waste, pollution of marine ecosystems by urban waste and coastal erosion are a selection of the environmental problems Senegal and its neighbouring African countries are facing. Yet the solutions seem within reach. The series allowed for different sectors of society – citizens, the private sector and public authorities - to brainstorm and make decisions on the issues raised. Coincidentally, during the “Green Talk” debates, the Council of Ministers approved the draft bill banning the manufacture, sale and distribution of plastic bags of less than 30 microns (black bags) and the free distribution of all plastic bags. The debate on coastal erosion was held just in time, allowing a recommendation for a multi-sectorial approach to be included in the new bill on coastal management, calling for the law to also integrate social and economic dimensions of land usage and rights. Green Talks were a call for action and described by audience members as a meeting place of “those who want to but cannot and those who can and do not”. In 2015, we experienced a moment of deep sadness: Assane left us forever. Assane Seck was a professional developer of Web and mobile applications. He developed and implemented many applications in Africa. He believed that "it would be amazing to gather people from diverse horizons around local and environmental issues". A member of the Ecofund team, highly competent and yet extremely humble, Assane joined our environmental cause by offering his expertise and time to the development of our web platform. He proudly represented the dynamism of young African entrepreneurs. In addition to losing a precious member of the team for his vision and his commitment, we also lost a very good friend and an exceptional human being. 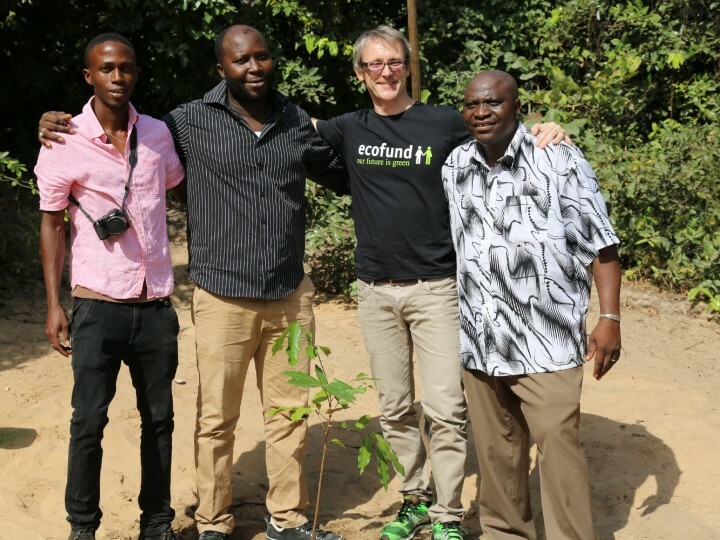 During the official opening of the Ecoparc, we planted a tree in Assane’s memory (see below Assane’s tree). It is the Touloucouna (in Wolof), tree also known by its scientific name as Carapa procera, an outstanding medicinal plant. You've gone too soon. RIP Assane. We will continue our green activities thinking of you. Ecofund was born in 2011 in Senegal following a meeting with people devoted to the preservation of our ecosystems, in order to boost their locally initiated, small and simple projects. Since its creation, during the last 5 years, it has done just that; identified, supported and financed 14 projects in three countries by raising a total of more than 100,000 Euros through crowdfunding. The Ecoparc project is a culmination of the Ecofund community's hard work and commitment. The Ecoparc and Green Talks are also great examples of the kind of local projects Ecofund believes in and wants to support in the future. After many years in Senegal, we, Sandrine and Markus, the founders and volunteer managers of Ecofund, have left Senegal for Morocco. It is in Morocco that Ecofund's next adventure will begin and we hope to introduce you to new Moroccan champions and their projects for the benefit of our planet and the benefit of us all! Happy 2016 and see you soon on this new version of our website. It is a great pleasure for us to announce that the Ecoparc nature trails are ready! Having contributed to the protection of the 32 hectares of the Ecoparc and created the first privately managed protected forest reserve in Senegal, you have participated in the enhancement of this magnificent area of conservation of the Casamance flora and fauna. The whole team of Ecoparc and Ecofund have spent the last six months creating two walking trails; one of 45 minutes and the other of one and a half hours with informational panels about the natural treasures to be found in the Ecoparc. We will let you in on the secret of how we achieved this. First, we identified more than one hundred species of trees and interesting places for visitors. These plants and sites were then narrowed down to reach a final selection of 30 points of interest along the trails. A team of students from the University of Ziguinchor, supported by Ecofund, then provided the scientific information needed to create the panels. We must stress that this work, which required both scientific rigor and adaptation of the information so it is easy for the general public to understand, was all voluntary. It was also further improved as we went along by invaluable contributions (thanks to Johannes from Germany and Marjolaine from Senegal!) and beautifully laid out by Moana, a graphic designer from Tahiti… it was a great collective effort from everyone, showing what passionate people can accomplish together! Don’t think this was easy! Each step was punctuated by its share of unexpected problems and difficulties. But challenges were always solved as is often the way in Senegal. Today, Jean-Michel, Augustin and Moïse, the Ecoparc team, put up the panels and carefully cleaned the paths ensuring the space is preserved as authentically as possible, just removing some branches here and there to make the walk easier and more pleasant. Finally, Augustin and Ecofund would like to thank all the individual donors and particularly the employees of Eiffage Senegal who, through their donation, have demonstrated their desire to do even more than the company has already done for the Ecoparc through the Ecolodge. Their support enabled us to produce the information panels with the help of local artisans in Diembering and Ziguinchor. Therefore in addition to the project’s impact on the conservation of the area’s natural resources, it also contributed to the local economy: carpenters and printers from the region worked with pride for Ecoparc by choosing materials that combine durability with basic environmental criteria. We are happy to invite you on Saturday 28 November 2015 for the official opening of the trails and the ecolodge, but we must admit that we love the idea that school children from the region are not waiting for this event and are already benefitting from the park. After all, these nature trails were made specifically with them in mind! We hope that travel agents and the Cap Skirring Club Med will now formalise partnerships with the Ecoparc to increase the number of visitors and therefore the number of people who are aware of the need to care for our precious forests! The travel agency “L’autre Sénégal”, Club Med and Ecoparc plan a cooperation that aims to boost ecotourism. Starting next season, excursions will be organised to the parc. A strong connection with the region’s touristic sector will increase Ecoparc’s visibility as well as its impact on ectourism in the Casamance. Works on both trails are almost completed. The texts for the information panels are still to be finalised by the students of the University of Ziguinchor. Regarding the second trail, some information points need to be freed of shrubbery and roots have to be removed along the path. The first trail however is already a popular destination to visitors and students from the region. For a better visibility, two Ecoparc signs have been installed at the beach as well as the road in front of the main entrance. Sandrine and Markus visit on December 28th to Augustine and Jean-Michel at the Casamance Ecoparc was the fourth Ecofund team’s visit in 2014. It is always a pleasure strolling through the Diembering primary forest, breathing in its fresh air, contemplating its majestic trees and creepers while listening to intense wildlife activities. For example, we were excited to see traces of the boa that comes weekly to the Ecoparc, returning every Sunday to the rice fields. We also saw that the strangler fig had completed its unwholesome task of felling its palm tree host. The opportunity of visiting such a forest in Senegal is indeed a rare treat, since Senegal’s classified forests are barely accessible to locals (due to lack of development) and totally unknown to tourists. The Casamance Ecoparc is an exception. Our Ecofund community members are happy with their contributions which culminated in the excellent first result of preserving 32 hectares of the Ecoparc through fencing the forest and formalizing its status with the signing of a framework agreement. It is important to continue the work. The forest will be accessible, welcoming more visitors to discover its immense treasures which are valuable for creating awareness among as many young people as possible on the need to protect, enhance and sustainably develop our natural resources. 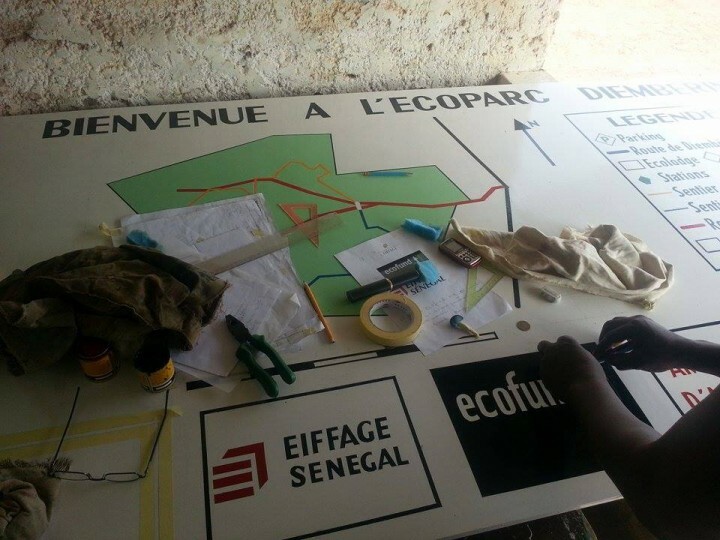 Thus, with the completion of the Ecolodge thanks to Eiffage Senegal and the Eiffage Group’s support in boosting the preliminary work carried out by Augustine, Jean-Michel and their team, the ecology trail will now to be set up in the Ecoparc to finalize the project. When the Ecolodge starts welcoming students, researchers, pupils and tourists for a well-deserved break after walking in the Ecoparc, the ecology trail will provide information to visitors on what they can see and on the hidden treasure of this forest. In addition, as the ecology trail is the Ecoparc’s hub, the Association for the Protection of the Environment in Senegal (EPAS - chaired by Augustin Diatta), NIAMBA Association and Ecoparc Casamance EIG (Diembering) in charge of Wildlife and Plant conservation, environmental education and ecotourism, will be involved in the elaboration of observation stations and associated trail signs. With Ecofund’s support, the entire local community of researchers from the University of Ziguinchor, who are already using the Ecoparc for educational purposes, and scientists from the Senegalese Institute of Agricultural Research and the Institute for Development Research, supported by local traditional healers, specialists in plants and their virtues, are presently collaborating, on the ground, on the preparation of information signboards. These signboards, designed to be simple but scientifically based, will include fun questions to liven up the guided tour, and the final quiz tour for visitors, especially schoolchildren. Note that access to the Ecoparc remains free for schools, universities and environmental education activities! To finance the production of eco-friendly signboards with termite resistant materials, we need your financial support. In fact, we still need to raise 5,005 Euros on our website. Click on the photo to support the Casmance Ecoparc project! By supporting the Ecoparc Phase II project, you will have the honor of being guided and pampered by Jean-Michel during your visit to the Ecoparc, and you can take pride in being a key player in environmental development and protection! We are eager to see the results in a few short months from now, to walk the two trails (one, in 45 minutes, the other in 90 minutes) and learn more about the fauna and flora at the educational stations. These trails will be operated, maintained and managed by EPAS mainly thanks to the potential income generated from tourism activities in the Ecoparc in the future. Meet your guide Jean-Michel in this video and listen to him talk about his experience at the Ecoparc! 13.10.2014 › Save the Casamance forest ! We invite you to read the below testimony of Marjolaine, who recently visited the Ecoparc. We also invite you to watch “Le trésor du Sénégal” on coming Friday 17th November at 19:30 GMT on the French TV France 3 programme “Thalassa“; a documentary film about the Casamance and the Ecoparc in particular. 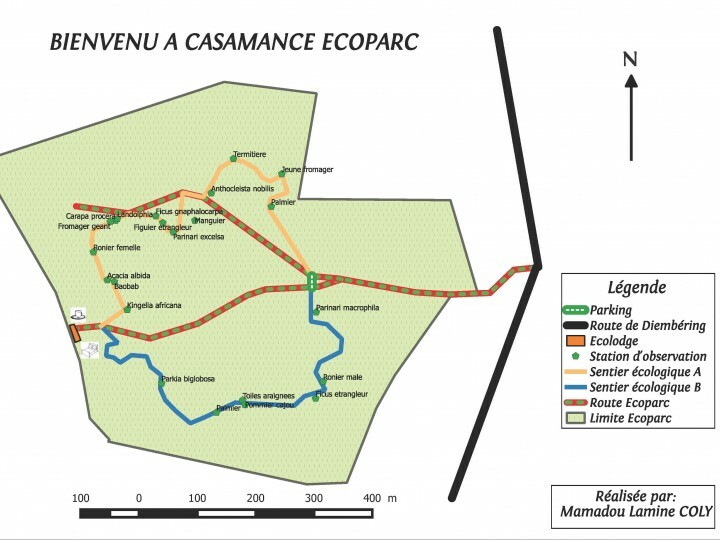 Your support to Augustin's project will be a big boost to set up an Ecological path within the Casmance Ecoparc! I visited Casamance, some weeks ago, invited by Ecofund and Augustin Diatta under the Ecopark Casamance initiative. Early July is the time to enjoy nature at its best in Ecopark Casamance ... It is similar to an excursion in the Amazonian rainforest (photo) for anyone living in Dakar, with its non-existent vegetation, especially towards the end of the dry season. It has been years since I walked in the forest, forgetting its smells and special sounds - music to the ears if we tune into it and take in its sights and tastes. I and the children watched big ants bearing a wide leave, observing earthworms, lizards, and spiders ... an array of animals live in the forest. No need to watch “Fourmiz” in cinema when it can be seen live here! I luckily spotted a monitor lizard and a pig, each at ease in the semi-savage environment. On the culinary side, one can, abundantly, enjoy mangoes and madds (saba senegalensis). I tested local fruits hitherto unknown to me such as ‘effoufe’ (photo), ‘somp’ and tol. During the visit, our guides from the APES association, Augustin and Jean Michel, showed us plants and trees with many medicinal properties: a chewable leave, a bark to brew etc. Here and there, one can find the Adansonia digitata, the baobab fruit nicknamed "imodium” a local opioid drug against diarrhea, and the precious carapa nuts (photo), which produce oil as prodigious, expensive and popular as any branded oil. We choose a 45 to 90 minutes trail, but took our time! After all, time is relative in a forest. So, we walked at our own pace, discovering the many wonders of this forest. For example, I've never seen so many termite mounds before (photo); they were almost everywhere. I also didn’t know termites could be found high up on branches, are very greedy, even gnawing at some signposts along the trail. They had also eaten up the wooden seats at the rest-spot near the big sacred baobab tree! We talked at each stop about the fauna and flora, local traditions as well as economic activities of the local population. Can you distinguish a palm tree from a palmyra tree or from a coconut tree, in the absence of the coconut? Otherwise the game becomes easy. For the uninitiated, it is easy to mix up the trees with similar long thin trunks even though the leaves are different. It is worth stating that the trees also look different depending on whether they are tapped or not. Augustin explained that all parts of the palmyra tree have a use: the trunk, roots, branches, leaves, sap etc. Does a more useful tree exist? Therefore, should it not be recognized and better-preserved? I was also interested in cashews. There were many on the ground because no one picked the fruits. And yet, they are profitable – the nuts of course, to be snacked on as appetizer. The juice can be collected by pressing the apple, yielding abundant and sweet juice. I know that on the other side of the border, in Guinea Bissau, factories transform and bottle it for sale. In Casamance, the quantity is probably insufficient for commercialization purposes. In addition, the forest has other products to offer. Further on the trail, Augustin showed us clearings being reforested; large areas “cleared" by slash and burn technique. The trees, with the exception of the biggest ones, were reduced to ashes, with those still standing becoming stronger (photo). This summer, new plants will be planted, an improved species of palm trees from Cote d’Ivoire, eucalyptus, mango and lemon trees. The aim is to re-introduce noble species among lianas, which make up most of the forest vegetation. A doctorate student will also be conducting research on madds, while observing plant yields based on specific environments. Augustin never imagined that this forest could lend itself to research, but surely his dream of protecting and promoting the forest’s rich resources has indeed become reality. 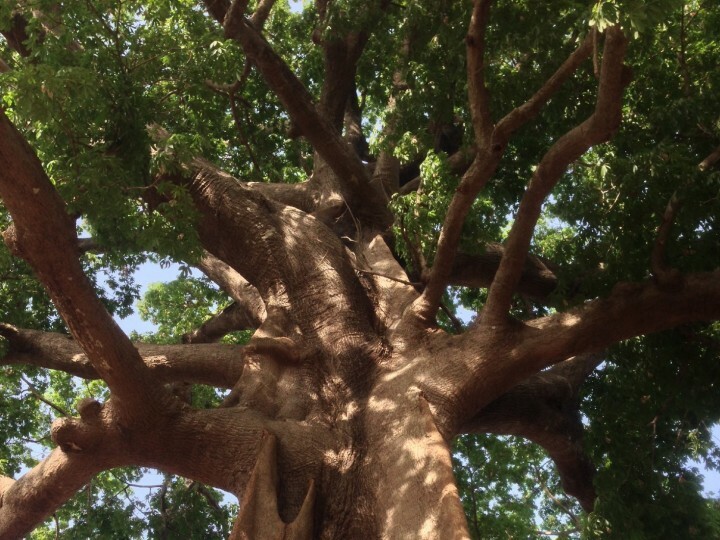 Thirty-two hectares of forest land have been preserved by his association, the Association for the Protection of the Environment in Senegal (APES), with the support from Ecofund Community. During my visit, I covered just a small area of the forest, reason for me to want to go back. Good news awaits the pupils and students, who regularly go on field visits to the Ecopark. A few weeks from now, the renovation of the Ecolodge (photo) will be completed, and it can then welcome groups wishing to extend their stay to enjoy the thousand and one attractions in the forest. Thanks to the availability of 90% of the requested funding, Augustin and our CSR Partners from Eiffage lunched the renovation works of the Ecolodge. Plumbing works are almost finished and the walls and windows of the huts have been readjusted to allow the visitors to fully benefit from the splendid view of the Ecoparc and the sea. For the readjustment works, we essentially use wood (e.g. bamboo) not only for its aesthetic aspect but also because of its availability in the locality. Enjoy the first photos of the Ecolodge taken in April by Daouda from Eiffage. OFIG!